Kirsty’s Gin is distilled using the carefully selected local botanicals chosen by their Master Distiller, Kirsty Black. The kelp, carline thistle & blueberry embody the elements of ocean, rock & land that surround the east coast, Angus farmlands. As fourth generation scottish farmers they perfectly nurture the crops that they use to distil our gin. They grow, distil & bottle on their own single estate in a true farm to bottle operation. Fresh and crisp on the nose, there are evident floral and citrus notes followed by black pepper, blueberries and rose water. Warm and spicy, the palate is creamy, well balanced and rounded. The finish is exceptionally smooth – fading slowly. FREE delivery to your door across the UK. Orders normally dispatched within 24 hours. The Stirling Family have farmed at Arbikie, a Highland Estate on the glorious Lunan Bay since the 1660's. Now under the guardianship of brothers Ian, John & David, their joint vision is to create the most progressive distillery in the world. Gold Medal Winner at the International Spirits Awards. 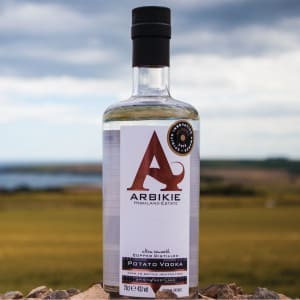 Arbikie... Distilling done the right way!